Explore…Experience…Live Life To the Fullest…!!! The park consists of a rocky landscape of amazing formations, from red domes to rainbow coloured towers and everything in between. The Valley of Fire is the oldest and largest state park in Nevada going back to 1935. Throughout the park you will discover ancient petrified trees, stunning rock formations and 3,000 years old native rock art known as Indian petroglyphs. It’s a perfect place for hiking, camping or just a day tour from Las Vegas, located only 88 km (55 miles) northeast of Las Vegas. The park got its name from the red sandstone that dominates throughout the area that were formed from shifting sand dunes. The rock formations were created from complex uplifting and faulting followed by extensive erosion. Other rocks include limestones, shales and conglomerate. The ridge of grey rocks are the oldest in the park, dating back to the Paleozic Era and are between 250 and 550 million year old. The red rocks are younger and were formed between 66 and 250 million years ago during the Mesozoic Era. The grey rocks are Paleozic limestone made up of the remains of plants and animals of the sea that invaded the area 600 million years ago. The sea advanced and retreated for 400 million years. Today you will be able to find evidence of fossils deposited in these rocks during that era. 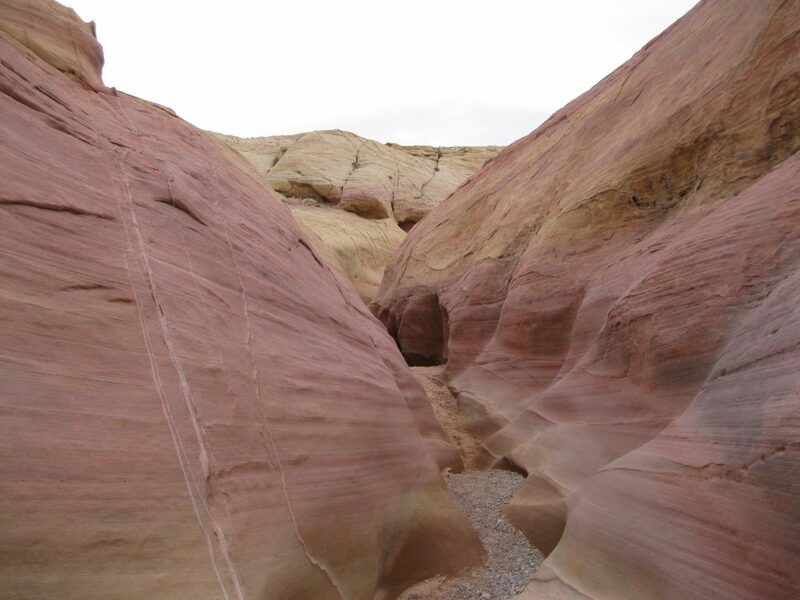 The red rocks of the Mesozoic area were formed when the sea retreated for the last time and the area became a massive plain of sand, silt, clay and gravel. The exposed sediments were subject to vast weathering, wearing them away and forming beds of mud, silt, sand and gravel. A desert, more severe than today, covered the area for tens of millions of years. 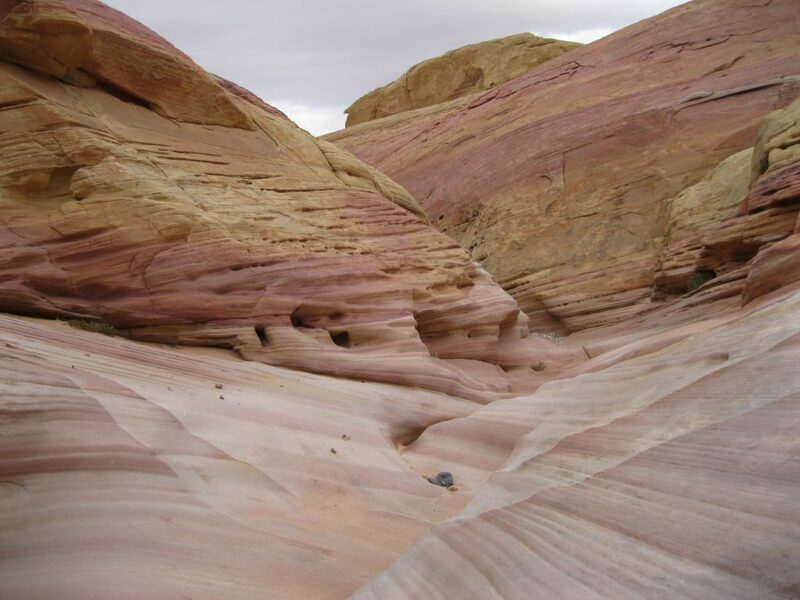 Strong winds blew hundreds of metres of sand from distant highlands to create huge dunes that would eventually become fossilised and eroded into the beautiful red and white formations of the Valley of Fire. About 100 millions of years ago, older materials were shoved onto younger ones, creating the Muddy Mountains. Thick Aztec sandstone deposits warped upward and eroded, exposing the soft shales of the ancient sea below. The soft shales of the Mesozoic bed were exposed, eroded away and created the vast valley of the park. About 3.2 km (2 miles) of rock have been eroded away. The Muddy Mountains seen across the valley are a result of a major movement in the Earth’s crust 70 million years ago. During the Paleozic era, an oceanic plate slid eastward beneath the western edge of North America along the coast of California The compression led to grey Paleozic rocks being shoved over the younger red rocks many miles to the east. So it was a reaction of local deposits to the powerful pressure at the edge of the continent many hundred miles to the west. 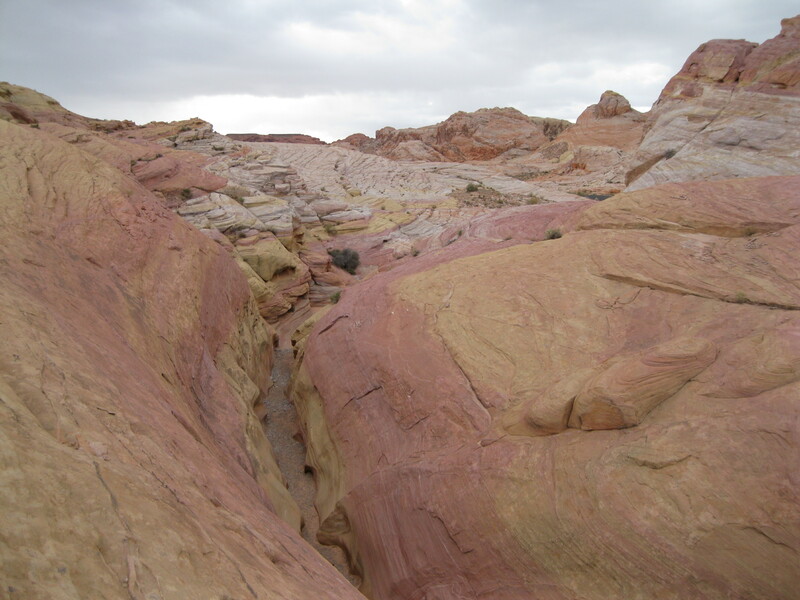 The thrust is a continuation of the Keystone Thrust exposed in the Red Rock Canyon close to Las Vegas. Due to the complexity of the thrust, it is a bit of a mystery to geologists. The Muddy Mountain Thrust is a fascinating aspect of the geology and scenery. If you look closely, you will see a line marking this across the range. It’s a very complex fault and in some areas of the park it is nearly horizontal and in other places almost vertical. You will see grey dolomite in contact with red sandstone that is nearly vertical, known as the Arrowhead Fault. 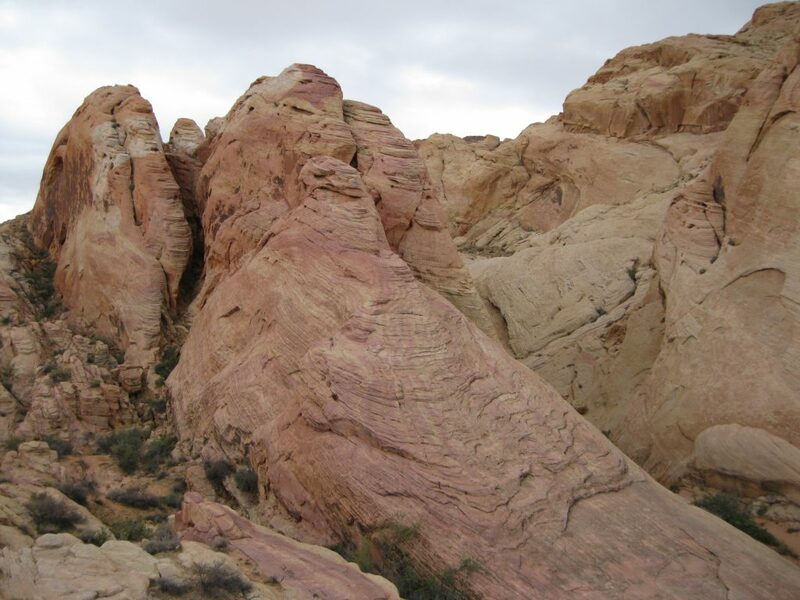 The forces of geology are ongoing and over the course of hundreds of millions of years, the Valley of Fire have been created as one of most geologically interesting and stunning areas in Nevada. You will find patches of black crust on the soil throughout the desert. This is known as cryptobiotic soils and are very sensitive and important to the ecosystem. The soil is a mixture of algae, lichens, mosses and cyanobacteria. It gives nutrients for plants and seeds and improves the soil typography and moister absorption. The crust is only a few millimetres thick, so do not step on it as it can take between 7-250 years to rebuild. The creosote bush, burro bush and the brittlebush are dominating plants. Furthermore you may see several cacti such as the beaver tail and the cholla. During springtime the desert marigold, indigo bush and the desert mallow will blossom. Another important aspect to respect is the wildlife. Do not feed the animals as they say “a fed animal, is a dead animal”. The wildlife has to find its own food. There are many different animals in the park. If you are lucky you may spot bighorn sheep. Birds that reside in the area are the raven, house finch, sage sparrow and the roadrunner, but don’t expect to hear a “meep, meep” from the latter while you’re in the park. Most desert animals are nocturnal so don’t expect to see a lot of wildlife. There are many species of lizards and snakes. Furthermore, the coyote, kit fox, spotted skunk, black tailed jackrabbit and the antelope ground squirrel are quite common. The desert tortoise is seen too, but is rare and protected. The Gypsum People camped in the area between 2000 BC and 200 while hunting bighorn sheep. Petroglyphs of the sheep, the spears and atlatls used for hunting are found in the park. The Basketmakers were hunters and gatherers as well and came to hunt for sheep from 50 BC to 1150. They were named after the sandals and baskets found in their ancient living sites. The Anasazi People came from 500 to 1,150 and built permanent settlements along the river close to the Valley of Fire. They developed farming in the nearby Moapa Valley and also lived of the bighorn sheep. The Southern Paiute arrived in 1100, survived drought and drove away the farmers. They were also gatherers and still live in Southern Nevada. The first Europeans to enter the land were fur trappers from 1824-1855. Due to the hostility of the area and the lack of streams and beavers it was not attractive to these men or later immigrants heading towards California. From 1855 till today, Mormons arrived and established a mission in the Las Vegas Valley and an outpost on the Muddy River in the 1850s. They founded five communities along the Muddy and Colorado Rivers. 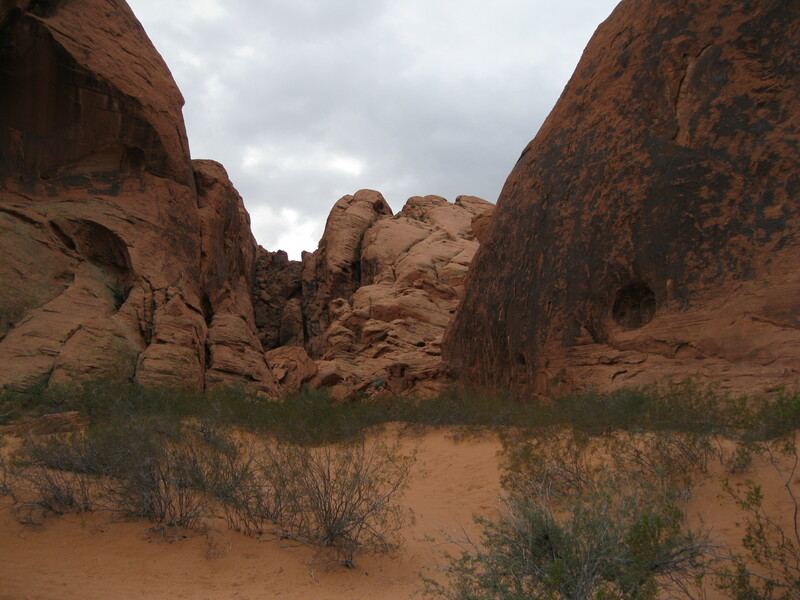 They did not depend on the Valley of Fire for food but still hunted for bighorn sheep here. 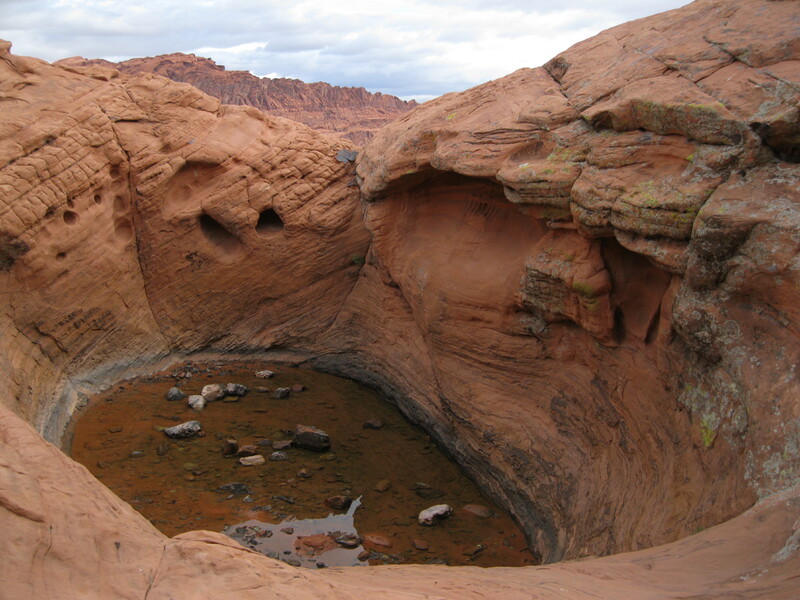 The Valley of Fire was a popular campsite of the peoples of the past. There are some remains, such as drawings, campsites, trails, hunting blinds and roasting ovens. Items like pieces of broken post and chips of stone are rare, but found. The areas with the most human activity pretty much has no trace on the ground. Organic materials such as baskets, skin, wood and bone decay fast and very few have survived. The religious belief, medical practices, astronomy, poetry, games and music have been poorly preserved. The petroglyphs seem to represent human and supernatural figures. There are very few clues to guide archaeologists to uncovering the events of the past. 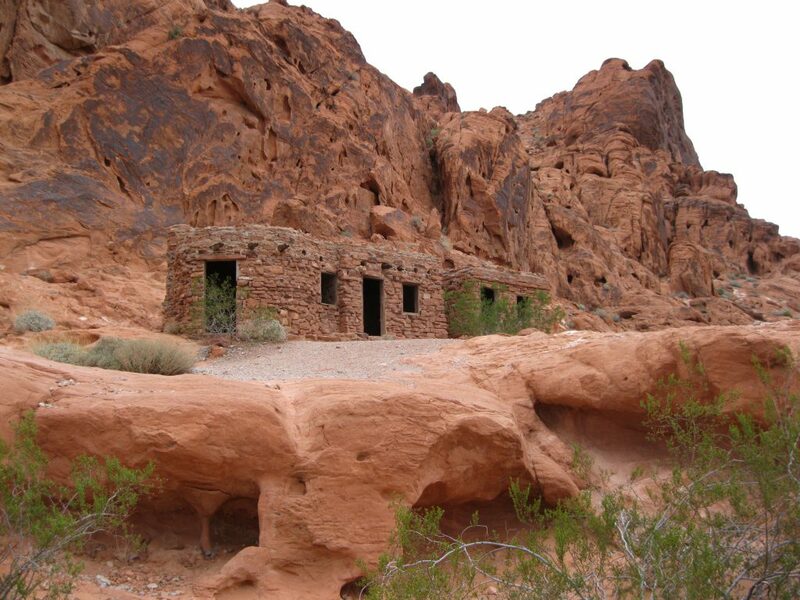 As the Valley of Fire has no streams and springs, it seemed unlikely that people had lived in the area in the past. It was considered that people would visit form the so-called “Lost City” villages of the Muddy River Valley. When excavations began in 1924 it was with focus on these pueblos. The same year archaeologist Mark R. Harrington named Atlatl Rock for the petroglyph symbols of the ancient tools on the rock. During the next several decades attention was paid on the petroglyphs. In 1961 the state museum conducted an official survey of the Valley of Fire archaeological sites for the Nevada State Park System. In 1976, the first scientific excavation took place. The dig resulted in a surprisingly large portion of remains giving a glimpse into native life of 4,000 years. It took place at three sites. One site showed human activity from 4,000 ago till quite recently. Such finds are rare in the Mojave Desert. Springtime would be the favourite season, actually due to the water supply natural banks and most likely small springs in the day. The food sources would be the same as today such as tortoises, big horn sheep, hares, rabbits, lizards, birds, eggs, insects, nuts, flowers and gourds. Until the 1920s the Valley of Fire was unknown to the people outside the region until automobile touring became popular, the word spread and the petroglyphs gained national attention. 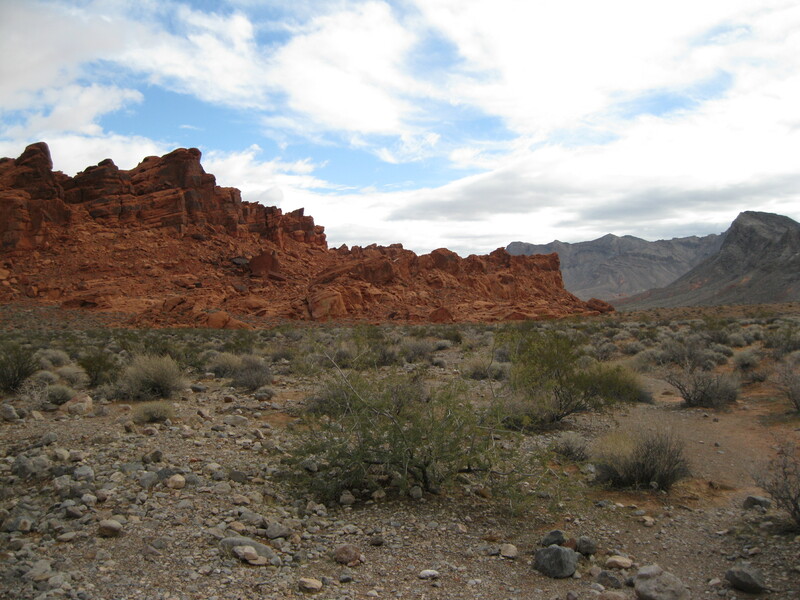 With the creation of the Valley of Fire State Park a long period of isolation ended. The Valley of Fire was originally a part of the land set aside by the federal government for the Hoover Dam construction. In 1931, the State of Nevada requested that the area was given to the state to be set apart for all times as a state park. Prior to that, the land had been under federal control ever since the area became a part of the United States in connection with a treaty ending the war with Mexico in 1848. To prepare for a future park, a new road and a campground were built during the winter of 1933-34. Furthermore, a large dam was constructed around a natural tank to ensure sufficient water supply for future visitors. Thanks to the federal Civilian Conservation Corp, pushed by congressman James G. Scrugham, this was financed. Thankfully, the park became a reality in 1935 when the site was named as one of the four areas in first State Park System of Nevada. Sadly from 1941-1954 in the wake of the Great Depression, the park had been neglected and was running out of funds. It was decided in 1941 by state legislation that land in the park could be claimed by individuals in return for more valuable federal property in the Las Vegas Valley. About 8 square km (3 square miles) were lost by 1955. Between 1954 and 1956 the interest in state parks thankfully revived and in 1955 local civic leaders pushed for land claims to be cancelled and requested that the lost would be returned. 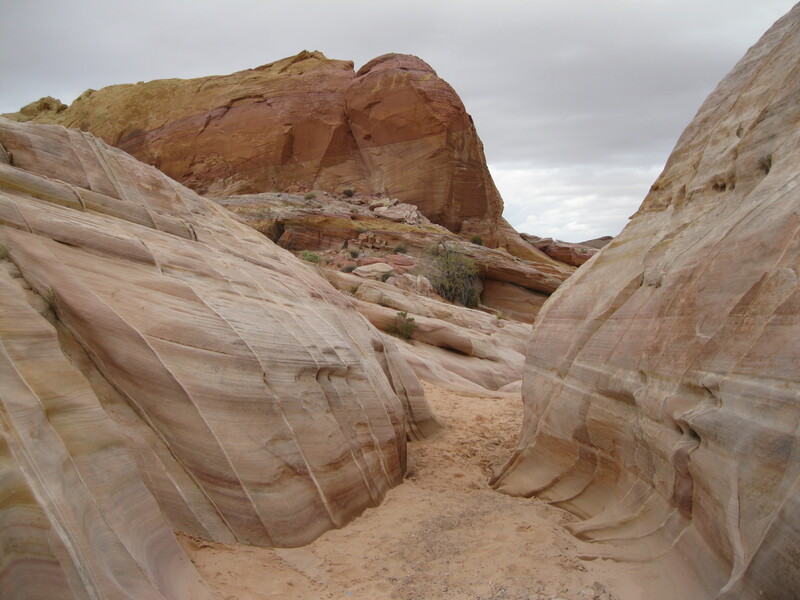 Today the Valley of Fire covers more than 182 square km (70 square miles) and has more than 312,000 visitors annually. 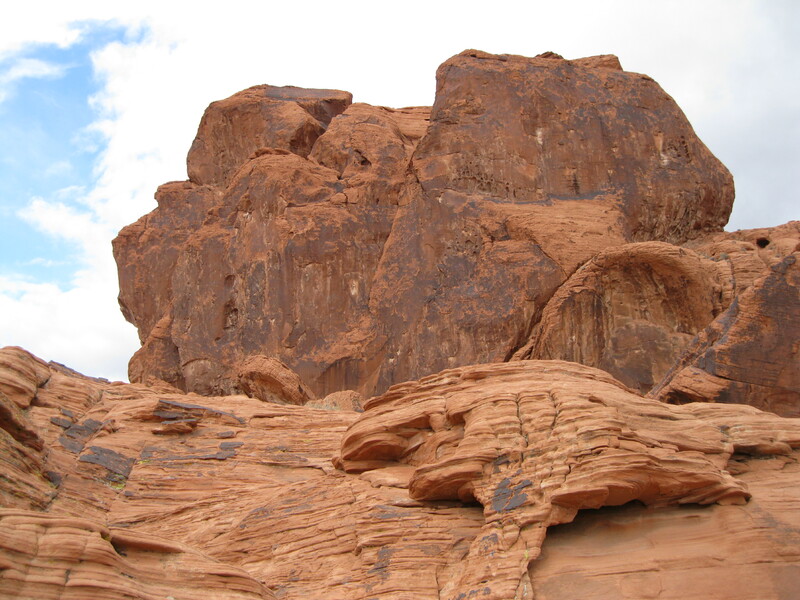 If you are in Las Vegas, a full day tour of the Valley of Fire would be a great option. You can either go by yourself or join a tour. It’s only a short drive from Las Vegas. 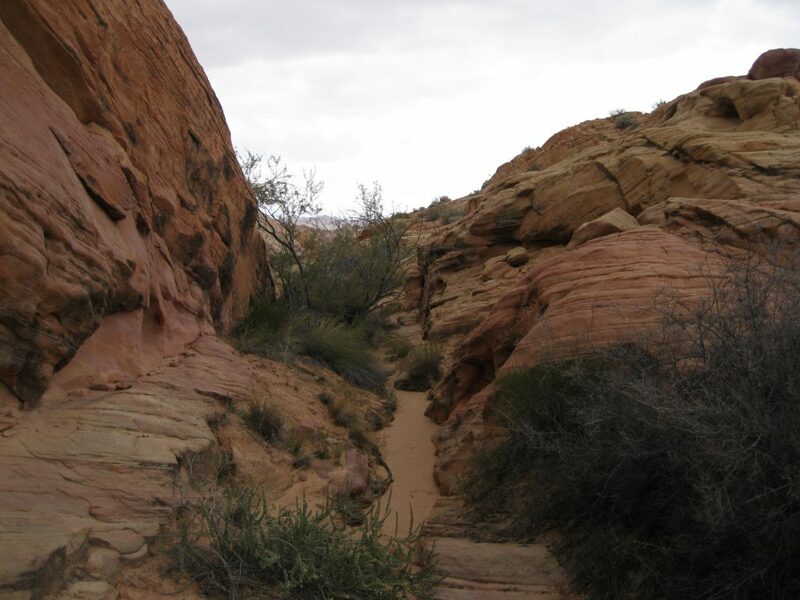 When you arrive at the park you can enter via the Valley of Fire Highway from the south of the park. You will see a park sign upon arrival which is a perfect spot to get you photo taken. In areas of the park, the roads and the facilities are way too close to the beautiful rocks. Such as at the Seven Sisters which is a stunning series of rocks. Here the park management decided to but facilities such as picnic tables, a shelter, parking facilities and signs in the middle of the formation which completely ruin the view. This is such a shame. But thankfully, this is only seen in a couple of places. 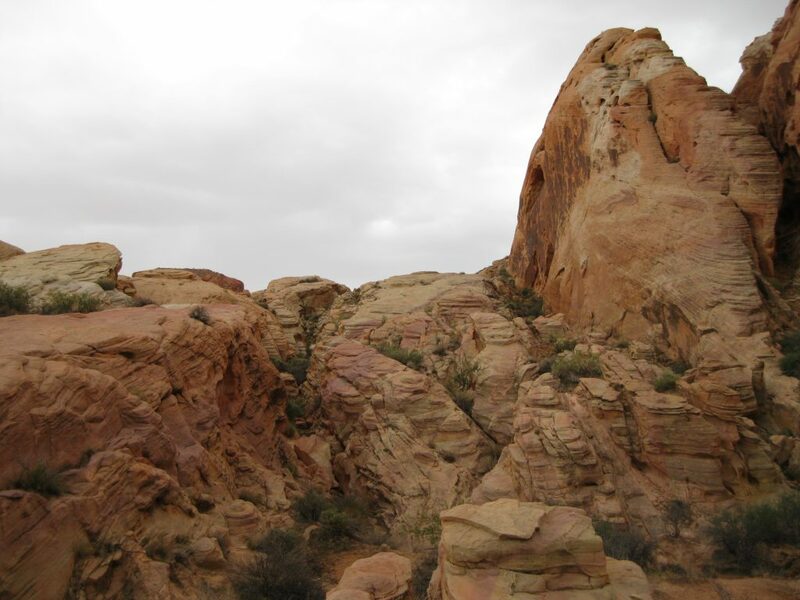 If you enter the park from the Valley of Fire Highway you will get to the first point of interest which is called the Beehives. Fossil dunes sculpted by the wind and water into beehive shaped formations. Have a stroll around here and check out the scenery. You will not only see beehive shaped rocks here, as there are a lot of other cool looking formations. You can explore the rocks up close and also check out the amazing ranges you’ll see in the distance. A half hour can easily be spent here. The Beehives are a great example of geologic cross bedding. 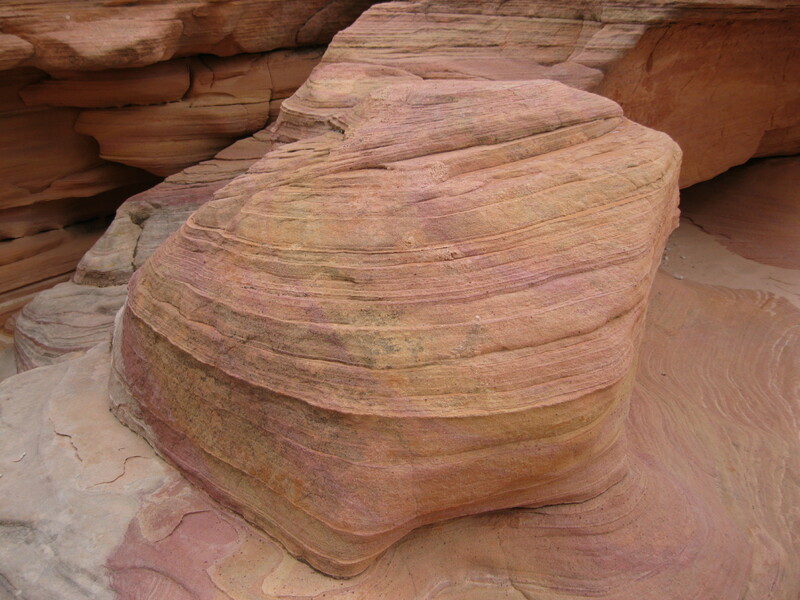 The different layers exposed in the rocks are a result of silt being deposited at different times. The angle of the lines indicates the direction of the water and wind at the time the deposit occurred. The contrasting grooves represent different times. An interesting aspect here and in the other areas of the park is the presence of lichen on the rocks which is quite unusual for red rocks and sandstone. Also pay attention to the native rock art on the rock walls. Another cool feature is the many swirls and lines in the rocks that marks different times with layer upon layer. Note the dark stained rocks. They are a fascinating feature in the desert. 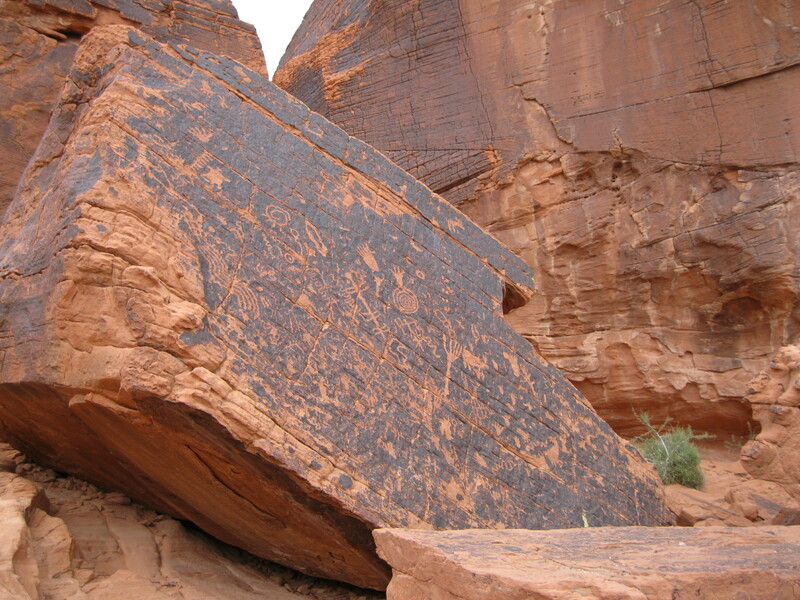 It is known as “desert varnish” and it occurs when iron and manganese in the rocks interact with water and living organisms such as algae and fungi. On some of these you will see the petroglyphs. The black colour was perfect for the people of the past to write on as the art work would clearly show up on the dark background afterwards. A stroll through the sand dunes, up and among the rock walls is reminiscent of a scene from a classic western. Walk around and take your mind back to how the native people would have lived here back in the day. If you walk a bit further beyond the car park and the road you will have a great view of the landscape on the other side. Here you will see the amazing contrast between the grey and red rocks. Awesome view. The Visitors Center is a great place to pay a visit. Here you can have a look at the different panels and learn more about the history and geology of the park. Furthermore it is recommended that you have a walk around the surrounding area as well. 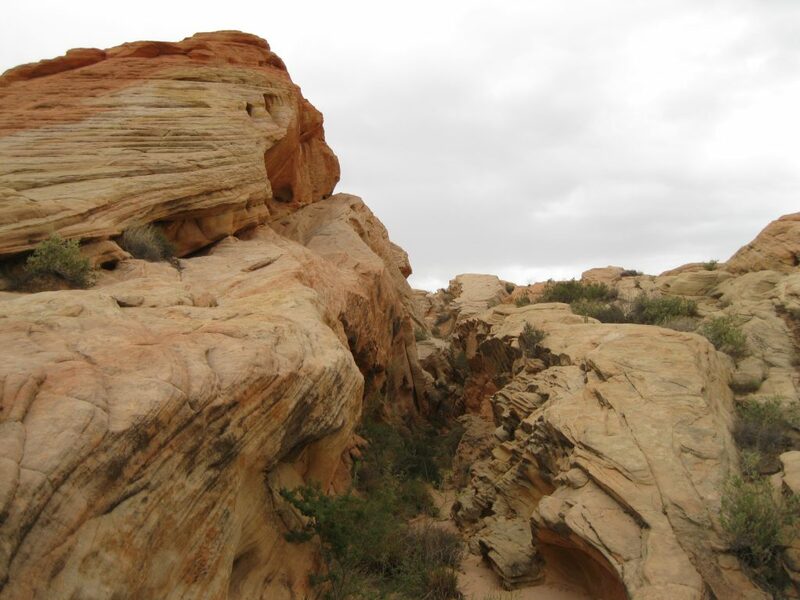 If you stroll down behind the Visitors Center you will find some awesome views of the red rock formations up close. Have a look around here and you will also be able to get great views of the valley from here. You can take some great photos of the grey range of the valley fronted by the red rocks up close. Afterwards, also from the Visitors Center, you can stroll down a short trail to the Balanced Rock. This is an easy walk on level ground which is not strenuous at all and is well marked. Also here you will have great views of the surrounding rocks which will appear very near. The Balanced Rock is an awesome sight. From certain angles it looks like the top of the rock could off at any time. A really cool historical spot to visits is the Cabins. These cabins were constructed by the Civilian Conservation Corps shortly after the park opened in 1935. They consist of native sandstone and were used to shelter visitors. The Cabins have been preserved as a reminder of the efforts of the corps. Approximately 9,000 people visited back in 1936. This is a great set of historical structures and fit in perfectly with the background of red sandstone. Have a look inside the Cabins and have a walk around and up the rocks. You can get some great shots of the red rocks, the Cabins, the valley and the Muddy Mountains in the background as well. This is also a great place to have lunch. So time your visit, so you will be here around lunch time. There are some picnic tables close to the Cabins where you can have a sit down. Going to Rainbow Vista is an absolute must. 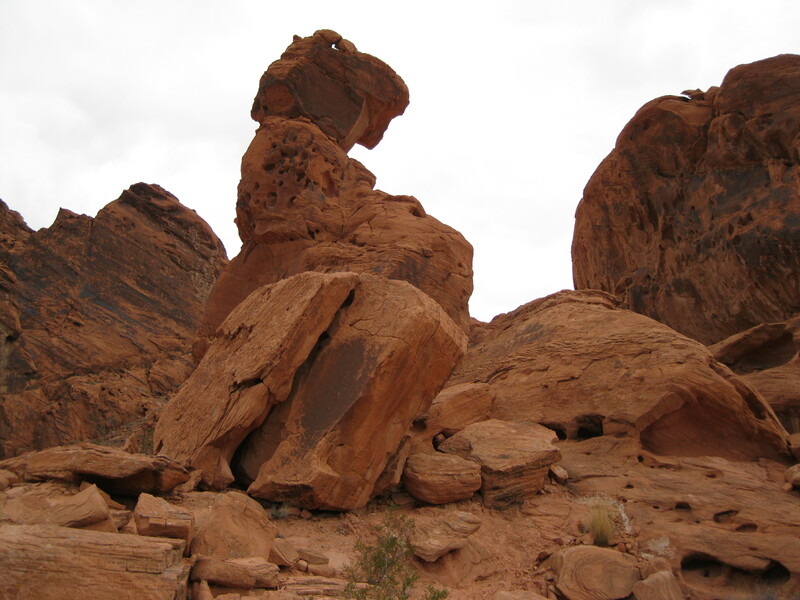 In this part of the park you will see even more amazing rock formations. As the name suggest you will see rocks in rainbow colours. These are some of the most beautiful rocks you will ever see. This is quite breathtaking and is a definite highlight. There are two options at Rainbow Vista. You can go to either side of the road. Have a look from the road down towards the rainbow coloured rocks. Take some shots and then walk down closer to the formations. You should definitely do this as you will get some stunning views of the rocks up close. It is not too strenuous but you have to do a bit of climbing. 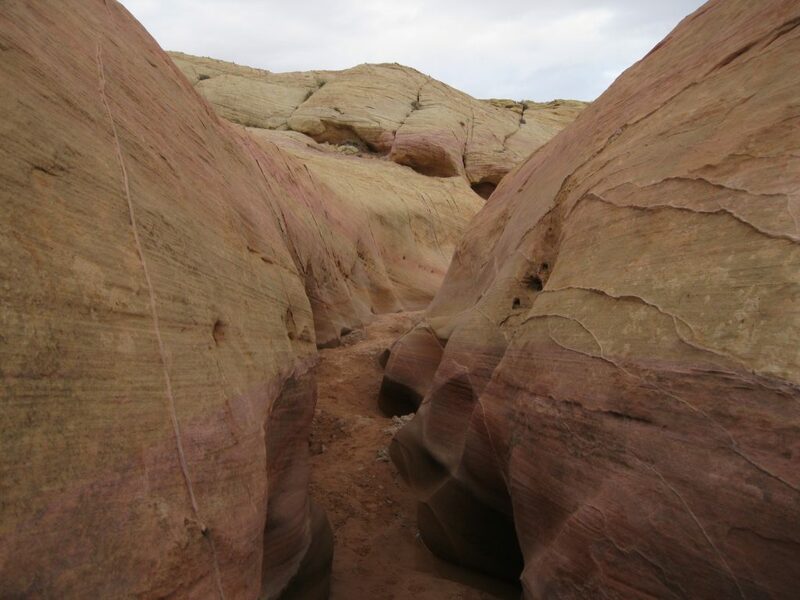 The views are both of lighter beige coloured rocks mixed with the red rocks and the further down you get you will see banded beige, yellow, red, pink and purple rocks all mixed together. Also among the rocks you have all sort of vegetation giving the place an amazing character of remote wilderness. You will be astonished! The further you go down, the better angles you will get and you will wander in between the small gaps and chasms, up along the fins. There are plenty of opportunities to get some awesome shots and views. It is quite a maze. This is an absolutely killer experience in the Wild West! The range of colours is amazing and beautiful. If you take a photo of the rocks up close you can get a great picture of the combination colours as well. Furthermore, from here you will have a great view of the valley. If you walk down on the other side of the road you will also have a great views of domes and sand dunes in beige and red. Not quite the rainbow colours of the other side but still amazing and you will also have a great vista of the valley. A bit of a hidden gem is going down to what is known as Wash Number Five. This is also a highlight and yet another must. Here you will find jaw dropping beauty and also some of the most beautiful rocks you will ever see. Park your vehicle on the side of the road and have a walk down this wash. 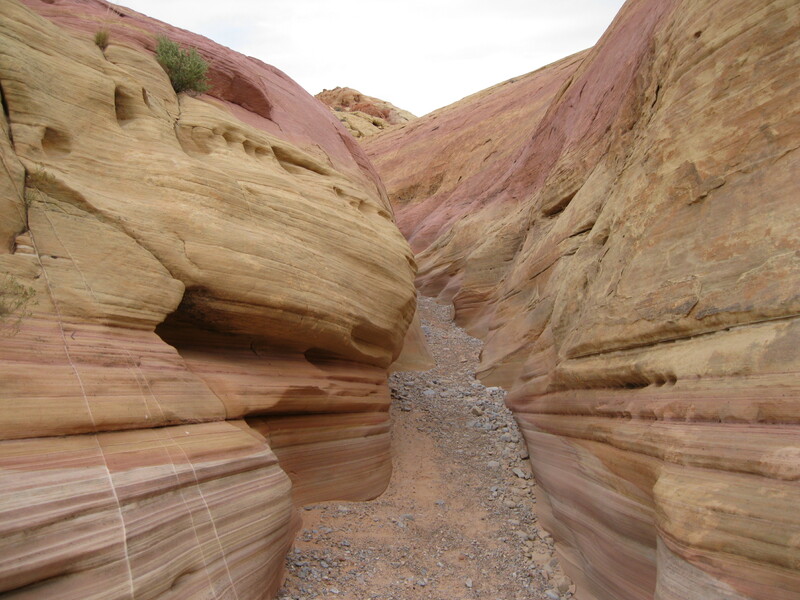 It will be a stroll down sandy terrain through the wash which is like a small canyon. Here you will also you see amazing rainbow colours up close and it is even more spectacular than at Rainbow Vista. You can get stunning shots of the banded and layered rocks in beige, yellow, red, pink and purple. The opportunities for beautiful shots are endless. The rocks are swirling down the wash in all sorts of shapes you can imagine. It will leave you stoked. The wash starts of wide then becomes more narrow and then a bit wider again. You can easily spend half an hour to an hour here. It really depends on how much time you have. Climb up on the rocks and get a different view. You will get a great bird eye’s view down the wash. This area is so amazing. You feel like strolling through at a slow pace in order to take all the details in of the scenery and study the rocks closely. It is truly stunning and will leave you mesmerised.